Worst Tick Season 2017 is Here! Doctors and entomologists are predicting that 2017 is likely to be the worst tick season and for a reason. Tick population is on the rise and so are tick borne diseases thanks to warmer weather courtesy of climate change. Also, heated buildings in winters ensure that tick season does not really it end. Rather, it continues all year round. Earlier, experts believed that there were fixed months in a year that saw increased tick activity. Now it is no longer the case and people need to be aware of Lyme disease (and other tick borne illnesses) all year round. When are ticks their worst? Up until 2016, ticks were believed to be at their worst as soon as the warmer or spring months began. Also, their populations declined naturally towards the end of fall with very few ticks being seen at start of the cold season. This year however, doctors are cautioning people living in tick infested areas (which include almost all 50 states of United States) to use tick protection for their pets all year round. Why is 2017 being deemed as the worst tick season? Climate change- This is causing warmer temperatures than normal. 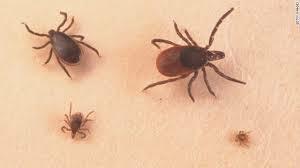 Increase in rodents and mice that carry ticks. According to entomologists from Cary Institute of Ecosystem Studies, NY, these are the main reasons why 2017 will be the worst year for Lyme disease. Also, as per epidemiologist Kiersten Kugeler at the CDC, we might see cases of Lyme disease triple this year since those in past decade. That is saying a lot, since we are already having 300,000 cases per year in the US. Skin rash which need not necessarily be the ‘target’ or bull’s eye rash. What to do if you find a tick on you? First of all, do not panic. Get the tweezers and gently pry out the embedded tick. Make sure you pull the entire tick out so grasp it closer to its head. Never ever squeeze the tick as this might cause it to regurgitate its stomach contents which could increase the chance of infection. Note that not all tick bites lead to Lyme disease but all it takes is one tick to bite and infect you or your pets. Never use Vaseline or Vicks or lighted matchstick to kill the tick. These methods do not work and can even be dangerous. Once you have pulled out the tick, put it in a Ziploc bag and take it to your nearest health center for identification and possible testing for Lyme disease causing bacteria (Borrelia burgdorferi.). Do ensure you check out 2017 Lyme disease map. The CDC carries a Lyme disease map on county level. This can help you assess your risk. Doctors tend to report their cases here and that is how they create such a map. The incubation period of Lyme disease is approximately 48 hours. So continue monitoring your health for the next few days. If you feel feverish or have developed a rash, headache and/or signs of confusion etc seek medical help immediately. Taking antibiotics is the only way to cure Lyme disease. You need to take the entire dose and not stop half way just because you feel better. The earlier you take the medicines, the less likely you will suffer from complications and chronic symptoms of the disease. Not all blacklegged ticks carry Lyme disease, so if you are asymptomatic, you need not see a doctor. However, experts suggest that if you are living in a highly tick infested area, it is best to see a doctor even if you do not have any signs and symptoms of Lyme. Some experts also recommend a course of doxycylcine taken for one day to protect against Lyme. If you are an avid hiker, always inspect your body, clothes and shoes for ticks after the hike. Stay away from grassy trails. Before leaving your home, spray insecticides like DEET all over your body, clothes and shoes. Once you are back from the hike, bathe using an antibacterial soap and shampoo your hair. Toss all your hiking clothes in the washer and wash them with hot water and detergent or bleach. Dry them using the highest heat settings on the dryer. Always wear long sleeved clothes, pants and socks when outside in tick infested areas. Tuck the pants inside socks/shoes to prevent ticks from climbing up your legs. Wear a hat or a scarf as well. These days, Permethrin treated clothing is readily available for hikers and campers. They can repel ticks, mosquitoes and other pesky bugs. Make sure you protect your pets from ticks with tick collars, sprays or other spot treatment. Bathe your pet weekly using tick shampoos. Mow and trim your grass/lawn regularly. Also clear out the debris from under porches and decks to minimize nesting grounds for raccoons etc. This will minimize bring ticks into your yards. Stay safe this tick season and protect you and your loved ones from Lyme disease and other tick borne illnesses.